Market Hall is the East Bay place to go for food inspiration any time of year, but when you’re laying out a holiday spread, it can be an especially helpful place to stop. Market Hall chefs offer a full menu of prepared foods for each holiday, and they also generously share recipes like these for cooks planning to spend time in the holiday kitchen. 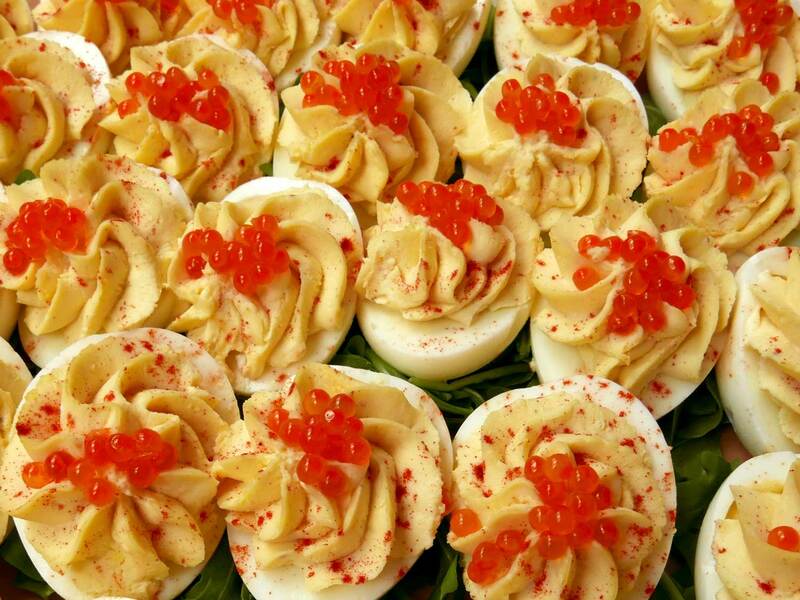 Trout roe adds a sparkle and burst of umami to classic deviled eggs. There will be roe left over, so serve it on crostini with crème fraîche. Place the eggs in a medium-sized pot and cover with cold water. Bring to a boil over medium-high heat. Once they come to a boil, cover, turn off the heat, and allow the eggs to sit for 12–13 minutes. Remove the eggs from the pot and cool in ice water. Once the eggs are cold, peel them. Cut the peeled eggs in half lengthwise and scoop the yolks into a medium-sized bowl. Gently mash the yolks with a fork and then fold in the mayonnaise, mustard, Tabasco, and salt to taste, until you have a smooth mixture. Using a piping bag or a teaspoon, fill the hollow of each egg white half with the yolk mixture. Top each with 1/2 teaspoon of smoked trout roe or an amount to your liking. Optional: sprinkle top with paprika. Often used as maror, bitter herbs on the Passover plate, or as the bitter herb in the Hillel sandwich*, horseradish with beets is also the very best accompaniment for gefilte fish. Freshly ground horseradish has an intense aroma, so use caution when opening the lid of the food processor. The heat of the horseradish varies from root to root, so feel free to adjust the vinegar, sugar, and salt to your taste. Don’t have a food processor? Simply grate the horseradish root and the beets on the smaller-hole side of a box grater. Trim beet stems to 1/2 inch and scrub them clean. Place in a saucepan and cover with cold water by 1 inch. Bring to a boil, reduce heat, and cook on a slow boil for 25–35 minutes, until beets are tender. Remove from heat. Drain and set beets aside. When cool enough to handle, peel the beets with your hands. The skins should slide off the beets easily. While the beets are cooling, either grate the horseradish or place it in a food processor with an S blade and process until fine. Add the cooled beets to the horseradish in the food processor. Process until fine and fully incorporated with the horseradish. Place the horseradish-beet mixture into a bowl. Add the cider vinegar, sugar, and salt. Taste and adjust to your liking. 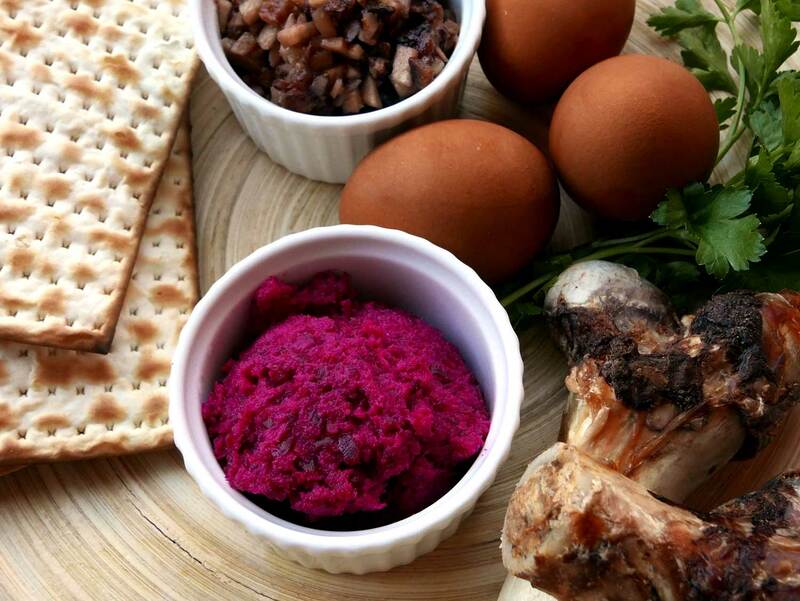 Serve as part of your Passover plate or as an accompaniment to roasted meats and gefilte fish. *Hillel’s Passover sandwich is comprised of matzoh, charoset, and bitter herbs. Market Hall Foods offers a full menu of Easter and Passover foods at both its Berkeley and Oakland stores, available Wednesday April 17–Saturday April 20. Find menu options and online ordering info here.